Organizations today are flooded with a large pool of applications creating a complex IT environment to manage. 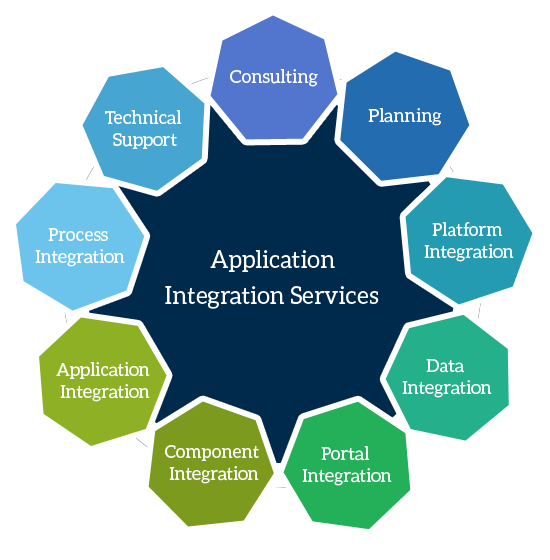 Ask Online Solutions’s Application Integration services help customers to integrate the complex applications and provide a single IT platform. An integrated It environment help customers to effectively manage the processes and disseminate the information in the entire IT infrastructure, thereby optimizing performance. Ask Online Solutions thoroughly analyzes your business needs and goals, indentifying the specifications and possibilities for your integration project and advising on strategy, design, and tools best suited for your IT infrastructure. Ask Online Solutions provides platform integration using constituents of web services, services oriented architectures (SOA’s) Messaging, Object Request Broker (ORB), Remote Procedure Call (RPC) and Publish and Subscribe based communication integration. Our expertise in enterprise technology platforms such as .NET and Java EE provides us with the platforms and tools to extract transform and manipulate data for our clients. In the context of XML, this also involves the greater task of metadata management. Our integration includes integration at the level of the business logic, transaction management and application services using component architecture of SOAP/XML framework or EJB/Struts framework. Involves the process and workflow modeling approach to integration using business process management (BPM) based approach. Interested in Application Integration? Contact us Today!